I went for an early morning walk today. It was an enforced walk: I had just taken our car to local garage for a regular service and check up. I could have asked my wife to pick me up in her car but she was still in bed. Despite the early hour, the air was already quite warm and I could understand why most of South Australia has had fire bans issued for the day. Our first burst of hot weather for the summer promises to be a good one. Time to hunker down and do some indoor things. Like reading. Or writing this post. On my morning walk I was aware of the vast amount of activity on the part of the birds. My walk took exactly 28 minutes to complete and I saw or heard most of the locally resident species along the way, including large numbers of Galahs. 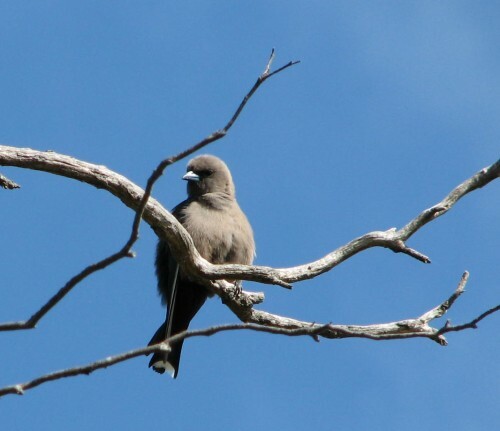 The highlight of the walk was two Dusky Woodswallows perched on the fence of a nearby neighbour’s property. While this species is a regular visitor to our little piece of Australia (5 acres), I can’t call it a resident species. This “pair” of birds – I use the term cautiously – have been sighted on a few occasions in the same spot over the last few weeks. I suspect that they are actually a pair and have a nest nearby. Quite a few years ago a pair nested in one of the trees in our front scrub near our house. Of course, I didn’t have my camera with me this morning, and my phone camera doesn’t have a zoom sufficient for the job, so I have posted below a photo taken some time ago. This was taken in our scrub near the house.